Ever wonder what it's like to be a two year old? Ever think back to those simple times when you were in information overload learning new things such as colors, numbers, words? Well, the best way to take the "Delorean" back to this innocent days is to live in a foreign country for an extended time. I knew when I was preparing for this trip, I was neglecting to learn some of the basics of the Thai language, such as numbers. I think knowing the challenge of the tones derailed me. I did purchase a phrase book at the Barnes & Nobles gave me enough ammo if I needed it. During my plane flight over the Pacific Ocean, I pulled the phrase book out and started reading up on simple greetings such as sawadee khrap (hello/good morning/good night) and khob kuhn khrap (Thank you). That should be more than enough to get me from airport to hotel! The next two months turned into a complete emersion into the Thai culture. You couldn't help but learn some of the language. From the first meals with the Thai associates where we learning things such as Pork, Beef, Chicken, more spicy, less spicy, delicious, etc. It didn't take long to pick up some of those words. Then over the course of the month we moved on to numbers and very simple phrases and grammar. 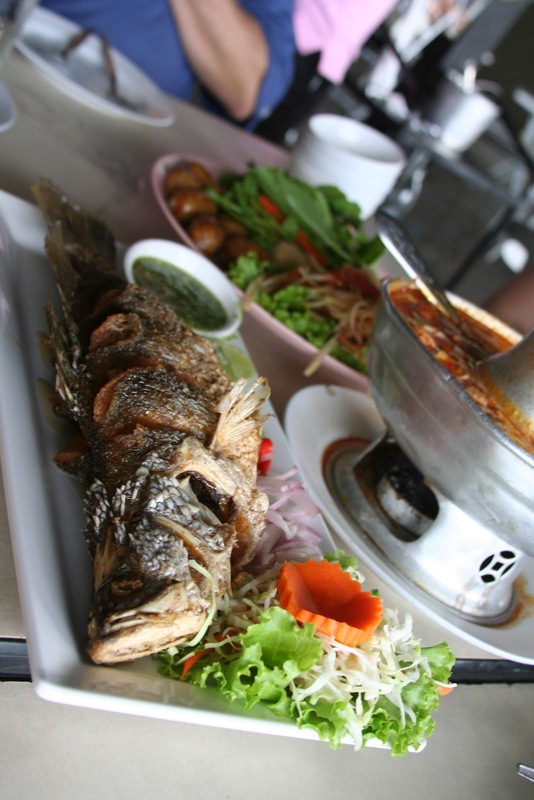 For example, the word for delicious is "a'roi", pronounced "aloy" (yes, the "R" and "L" stereotype lives true in Thailand). If you add the word "mai" to the end, it turns it into a question as "mai" is used to negate things. So "a'roi mai" means, "Delicious, isn't it?". You would then respond with "a'roi" for "delicious" or "mai a'roi" for not delicious. You can add emphasis to things by adding "mak mak" to it, meaning "more" or "very". 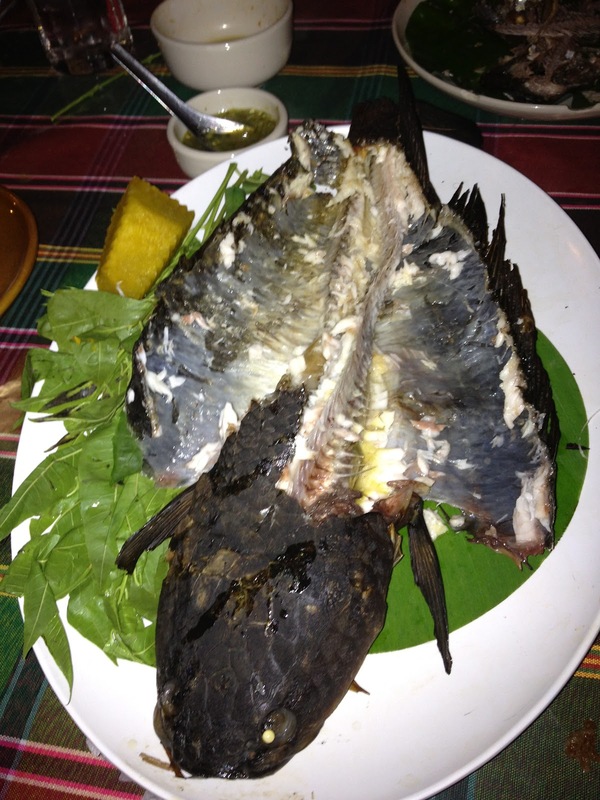 So "a'roi mak mak" is very delicious. One thing I've noticed about Thai language written in the "English" letters is that it is more of a courtesy and not something that is based on specific rules. I've found many versions of the same words "translated" to our alphabet. One thing that I did get translated was my name: สก็อต. Fried Baby Crab - A'roi mak mak!!! Squid pieces from the above platter. It's Squidy! This is the post-race food. 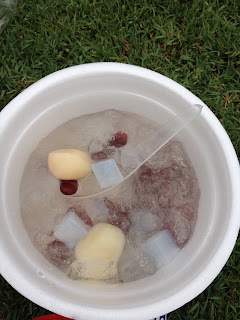 Lychee, Coconut Gel, Red Beans, sweet syrup and ice. Somewhere in this photo is squid and frog legs. 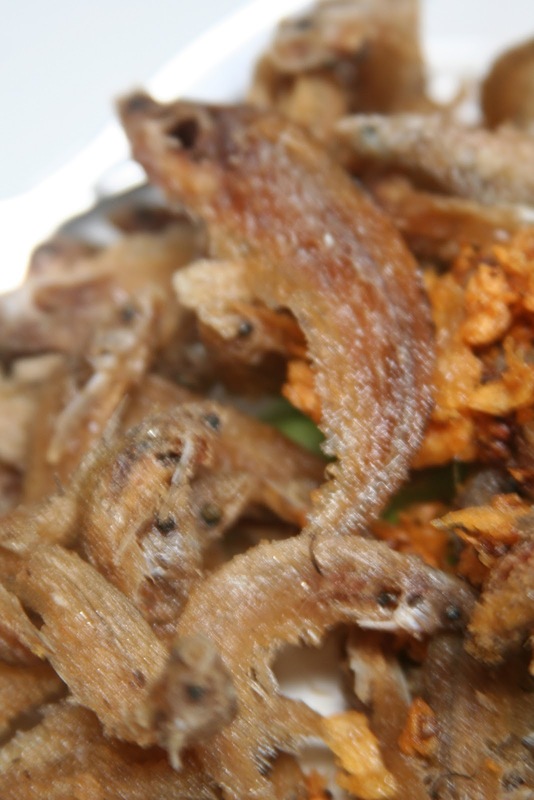 Some sort of fried fish. This were tiny and about the size of a minnow. Mushrooms. Not exotic, per se, but I'm not a huge fun of the fungi. 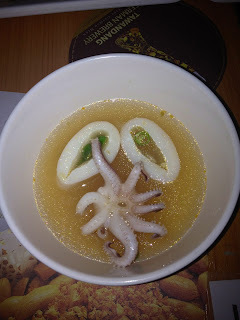 Other exotic (to me) food was Octopus and Jellyfish. When you take these Cephalopod foods together, I have a hard time discerning a flavor. The food just seems rubbery to me. I'm sure if I had a lot of the food I would be able to enjoy it more. It seems many people I talk to back in the US getting freaked out about the large whole fish, which I find rather odd. This is a cooking style in the US but maybe not as prevalent. The fish is quite good; however, I have a hard time with it because of the fish bones so I started just asking the veteran Thai associates to get me a piece to avoid the bones. I also do that because I'm more likely to destroy the fish trying to get a piece. Overall, I like how food is fried in Thailand. There is a sweet flavor to it and because most is small pieces, they don't have to cook it long so it's not overcooked. I will say that food I did turn down was raw fish. I've had it and don't like it. I have a hard time getting over the texture of the food, so I have a hard time tasting it. There was definitely a lot more exotic food but I couldn't find pictures of it to remember it. 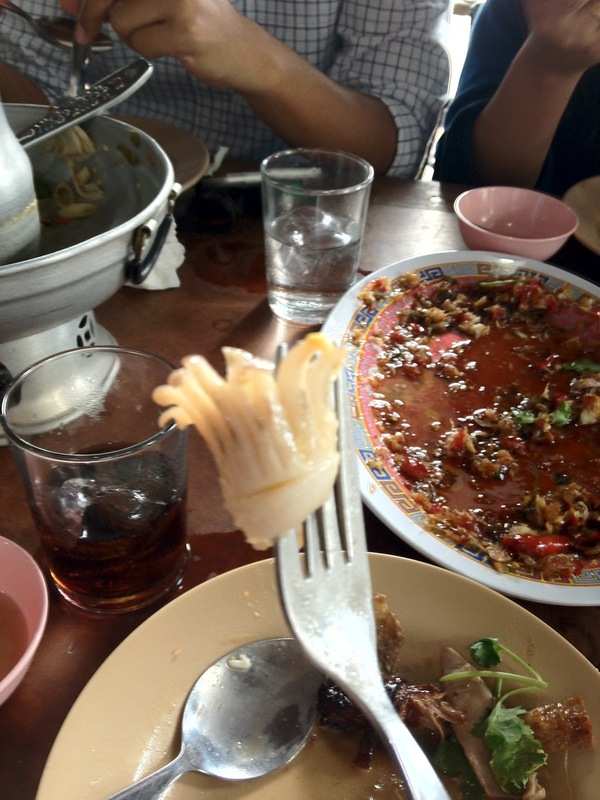 In Thai restaurants you don't get knives. You have a spoon and fork and that's it. In reality, you don't need a knife. Pretty much all foods are already served in small pieces so it's not necessary. Using the fork and spoon isn't necessarily that straightforward though. You are suppose to hold the knife in the left hand and spoon in the right. The fork then pushes food onto the spoon and you serve yourself from the spoon. Stabbing food with the fork and eating from it is considered rude, so I avoided it. Many of the dishes are served with a specific dip. You are not to mix with other dips of other plates. In addition, you will be served rice with your meal and I eventually learned to not eat the rice alone but instead only eat it with the dishes. I think this was one of the big reasons I gained weight out there (excluding the beer I drank, of course!). I would just sit and eat the rice while waiting for the next dish. Why would I be waiting for the next dish? Food is served to the table as soon as it is ready. So if you receive your plate but your table mates are still waiting, you start eating. It may be 5, 10 or more minutes before they get their food. Eat now so your food isn't cold. In the situation where a bunch of plates are ordered for the entire table to eat, you just eat what you are served when it is served. This is the typical meal. We would order 5 or 6 dishes and share. In one situation we ordered 6 plates of food and it took nearly 45 minutes for the last plate to be served. Not wanting to spend a lot of time on this but let's just say that most all toilets have spray hoses attached, similar to that of the sprayer on a kitchen sink. I will admit to using it and glad I did! One of the bathrooms I came across while at a pitstop on a road trip was a turkish toilet. I could have used a manual. Happy Hours are buy one, get one free. You order one beer and they bring you two. While in the US we have 1/2 price beers during happy hour, there is something pretty awesome about this. Learning the transit system. It's mostly because I always drive in the US. There is no need to learn the bus system but in Thailand we how to use the BTS SkyTrain system. Chopsticks -- I finally figured out how to use chopsticks; however, I've probably already forgotten. I brought two sets back to the US, so I'll take them to the next BBQ joint I go to. I'm sure there are many more items but these are the big ones that come to mind. Thanks for reading!